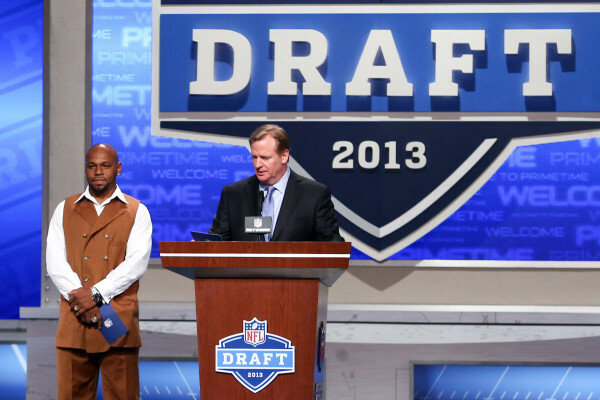 Former NFL running back Kevin Faulk (left), pictured during the 2013 NFL Draft, has been selected for the New England Patriots Hall of Fame. Faulk was elected into the Patriots Hall of Fame through a fan vote, the team announced Wednesday. Faulk joins Troy Brown (2012) and Tedy Bruschi (2013) as the third player to enter the hall as a career Patriot with three Super Bowl rings. He also is the fifth player to be selected by the fans in their first year of eligibility, joining Drew Bledsoe (2011), Brown, Bruschi and Ty Law (2014). “Kevin Faulk helped deliver three Super Bowl championships and redefined the way an entire generation of Patriots fans celebrated football in New England,” Patriots owner, chairman and CEO Robert Kraft said in a statement. “Despite entering the NFL as the second-leading rusher in SEC history, he arrived in New England without ego or pretense. He was a selfless and tireless contributor to the team, accepting every challenge and excelling in many roles throughout his 13-year career. His work ethic, enthusiasm for the game and clutch performances, especially on third down, earned him the respect of his coaches, teammates and fans alike. Faulk’s induction ceremony will be held on Aug. 1 on the NRG Plaza outside the Patriots Hall of Fame. In addition, Faulk will be honored with a halftime ceremony at the Patriots’ 2016 home opener against the Miami Dolphins on Sept. 18. Faulk concluded his 13-year career with the Patriots as one of the most productive players in team history. He filled various roles after joining the Patriots in 1999 as a second-round pick out of Louisiana State. He is the Patriots’ all-time leader in all-purpose yards (12,349) and kickoff return yards (4,098). He is also the Patriots’ all-time leading return specialist, totaling 5,041 combined return yards (4,098 kick return yards and 943 punt return yards). He ranks fifth in team history in rushing yards (3,607), fifth in receptions (431), 12th in receiving yards (3,701) and eighth in punt return yards (943). For his career, Faulk played in 161 regular-season games and averaged 4.2 yards on 864 rushing attempts with 16 touchdowns and caught 431 passes for 3,701 receiving yards and 15 touchdowns. Faulk is the Patriots’ all-time leader in receptions by a running back and is one of just 30 running backs in NFL history to reach the 400-reception plateau. During his 13 year career, Faulk helped the Patriots claim 11 winning seasons, including three Super Bowls titles and five AFC championships. Faulk is a member of the Patriots’ all-decade (2000s) and 50th anniversary teams as a return specialist.